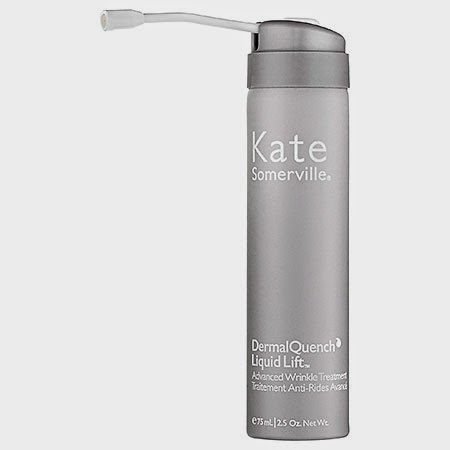 This at-home version of Kate Somerville’s most sought-after facial treatment produces results so amazing, people may even think that you’ve had work done. With a potent combination of wrinkle-relaxing perfluorocarbons (PFCs), hyaluronic acid, oxygen, and antioxidants, this antiager reduces the appearance of expression lines and wrinkles for skin that looks smoother, tighter, and firmer. The nozzle is super easy to use: after a few uses, you won’t know how you ever functioned without pressurized delivery. A scientific breakthrough, this patent-pending delivery system produces immediate and long-term results. DermalQuench Liquid Lift infuses the skin with three powerful ingredients in the advanced hydrafill complex. Wrinkle-relaxing PFC-oxygen carriers draw and lock in oxygen with an oxygen magnet and relax facial muscles to dramatically smooth and soften. Deeply hydrating hyaluronic acid provides fast-penetrating, long-lasting moisture to improve the look of elasticity, firmness, and texture of skin. Radiance-boosting botanical extracts instantly create a healthy-looking glow to reveal a more youthful complexion. A boost of oxygen for your skin, this oil-free instant lift treatment plumps, firms, and fills your skin. You can find Kate Somerville's products in Singapore Sephora.